You’re going to be a great parent. Your BlackBerry® can help. BurpBerry helps you track when your new baby last nursed, had a wet diaper, and more. Let BurpBerry keep track of the small stuff, so you can focus on giving your baby love and attention. BurpBerry remembers everything from how long and what side your baby nursed on last, to how long they slept. Sometimes these things don’t seem important until you need to know. When you’re tired, it can be hard to remember these details so let BurpBerry track it for you. Informed Decisions, even at 2 a.m.
As new parents, we’re all nervous. We’ll all make at least one late-night trip to the hospital because we’re not sure whether to be worried about baby’s temperature, irregular bowel movements, or whatever. BurpBerry has quick answers to the key questions that doctors and nurses will ask: what have baby’s temperature readings been, how much has baby eaten, how many wet diapers in the past 12 hours, and so on. BurpBerry let’s you keep using your BlackBerry®, whether you’re timing sleep for one baby or three, and nursing another. Check your email, update your Facebook status, or schedule lunch with a friend. BurpBerry will keep track of what your baby was doing. Simple baby management for multiple children, with the option to add, delete or edit a child. Add an unlimited number of children and photos to each profile. Quick switches between each baby via the BlackBerry® Menu button. 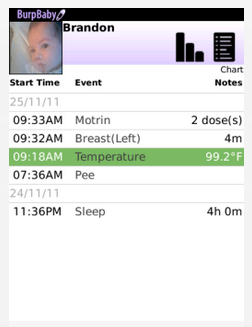 Easy logging for each of your baby’s sleep, diaper, nursing, temperature and medication events. Timers and/or manual entry for each event type. Displays which breast you last fed from, as well as the ‘last breast fed from’ and ‘time fed’ for each individual baby on the nursing screen. Quickly add medications to a customizable medication list. Customize each measurement type to display in either metric or imperial. Choose which screen you prefer to display when you start the application. Statistics screen displays a quick summary of your important information. Custom filters allow you to choose the time period you wish to view (last 12 hours, last 24 hours, last week). Chart screen lists all the events logged for that child in an easy to read format. Filter these results by event type or by date range. Remove any entry you wish. Multi-task to your hearts content. BurpBerry will keep track of all your running timers and automatically display the active timers when you next enter the application. The application icon on the BlackBerry® home screen displays whether you have an active timer. Easy application updates directly from the application. Email selected logs in multiple attachment formats (CSV or HTML). Optimized versions for both standard and touch screen devices.